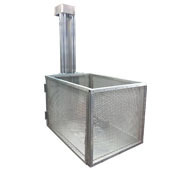 Cargo lifts come in vertical or incline varieties, for indoor or outdoor use. Weight capacity up to 250 lbs for vertical lifts, and 350 lbs for incline lifts. Incline lifts fold to increase space for foot traffic when not in use. Transports up to 250 lbs indoors or out - corrosion-resistant finish is ideal for coastal areas. Dual swing doors make loading and unloading easy. 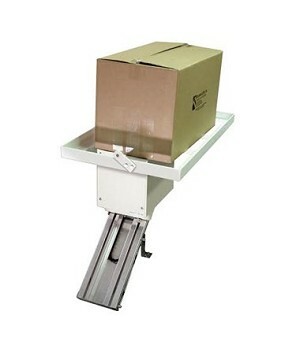 Incline Cargo Lifts mount easily on a stairway and has the capacity to move up to 350 lbs of cargo. Folds when not in use to increase space for foot traffic on stairs. This lift operates on standard 120VAC household current, and offers constant pressure controls. 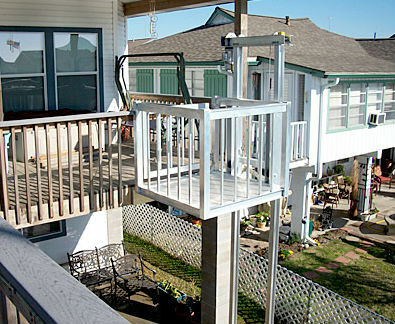 The outdoor Oncline Cargo Lift has zinc-plated components that help prevent erosion. Multiple covers are designed for exterior environments.